These challenges include the fact that it’s not always appropriate to have another person (interpreter) brought into a counselling session when sensitive, personal issues are being disclosed. A three way conversation is not as effective as a one-to-one conversation and also culture differences are huge between the hearing community and deaf community, and that affects the level of support given. A few years ago, the Department of Health in the UK finally recognised that deaf sign language users responded to therapy more positively when the therapist was also a fluent sign language user. Six deaf young adults have just completed a counselling course, training them to “listen” to other deaf people’s problems, and help them to identify solutions. All of these young people are involved with children and youth at Nzeve and will help at school visits, camps and other activities. 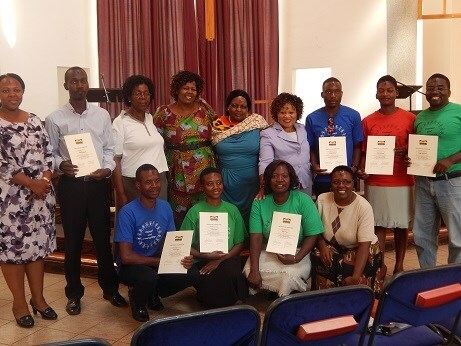 The certificates were given by the Pastoral Care and Counselling Centre in Mutare in collaboration with Africa University. We had taken part in the Africa University Chapel service before the graduation and it happened to be the Ash Wednesday service. We were all marked with ash on our foreheads – hence the dirty mark everyone has on their forehead! The seventh man with a certificate was the interpreter, all the others are AU staff.